Huge meadows, wild rivers, lakes, mountains, plateaus, thermal features including geysers and beautiful forests of lodgepole pine characterize this Southern Yellowstone hiking trip that seems to have it all! Most of the mosquitoes are gone, there’s a tinge of frost in the air and bull elk may be just beginning to bugle as the annual rut begins. Bear, wolf, moose, sandhill crane, and other wildlife species also abound. We usually have the opportunity to soak in hot springs, too. This is the quintessence of Yellowstone wilderness. We rate it moderate, and the trip base is Gardiner, Montana. We usually begin at the South Entrance, ending up at the Heart Lake trail-head. We’ll walk along and across the winding upper Snake River, and we always spend one or two nights at beautiful Heart Lake, one of the most magnificent wilderness lakes in the backcountry! We may also have the opportunity, weather permitting, to day-hike to spectacular views at the summit of Mt. Sheridan. TRIP BASE: Gardiner, MT: Comfort Inn, Route 89 Gardiner MT, phone (406) 848-7536; gm.mt411@choicehotels.com. Mention that you are a Big Wild client for a 10% discount. MEETING TIME: Pre-trip orientation including food and gear handout plus safety talk at 6 PM the evening prior to day one; meet in Gardiner Comfort Inn lobby. TRIP RATING: Most of the route on this moderate trip is on well-maintained trails, and the terrain is a pleasant mix of gently rolling forest and meadow. Daily mileage varies from 6-9, there’ll be at least one layover; total mileage (not including day-hikes) is about 25. ELEVATIONS: 6,800-8,200 FEET. Maximum one-day elevation gain with backpack is about 800 feet. An optional day hike (weather permitting) to the top of Mt. Sheridan or another near-by 10,000-foot peak includes a 2,500-3,000 foot elevation gain. WEATHER: Late summer is usually pleasant, but early autumn storms are not unheard of at the end of August. Be prepared! Brief thunderstorms are common; clear nights typically are frosty. 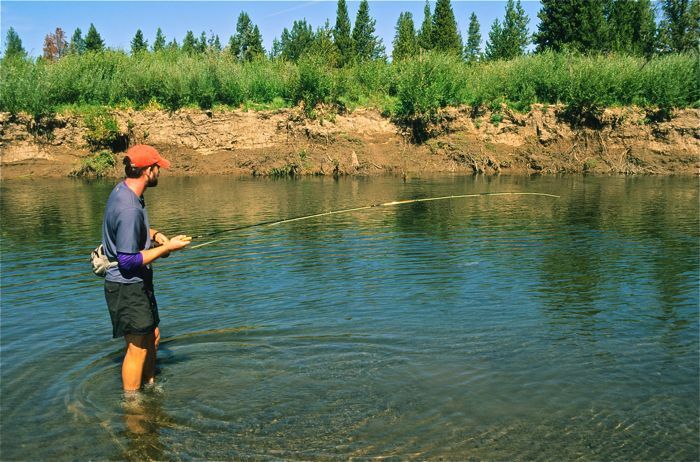 FISHING: You can fish in the Snake River or in Heart Lake. 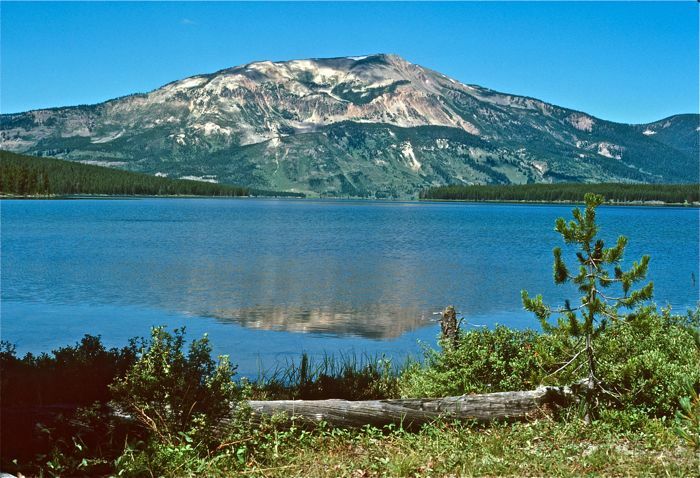 A Yellowstone fishing permit can be secured at the ranger station we’ll visit right before we hit the trail. SPECIAL FEATURES: Spectacular meadows, bull elk may be beginning to rut and bugle, possible wolf music and generally lots of wildlife viewing and activity. Spectacular Heart Lake. Weather permitting, a possible day-hike up Mt. Sheridan. Bathe in natural hot springs! Wild Yellowstone at its best! SPECIAL TIPS: This is grizzly country; so leave deodorants and other sweet-smelling substances behind. Be prepared for a few river fords. 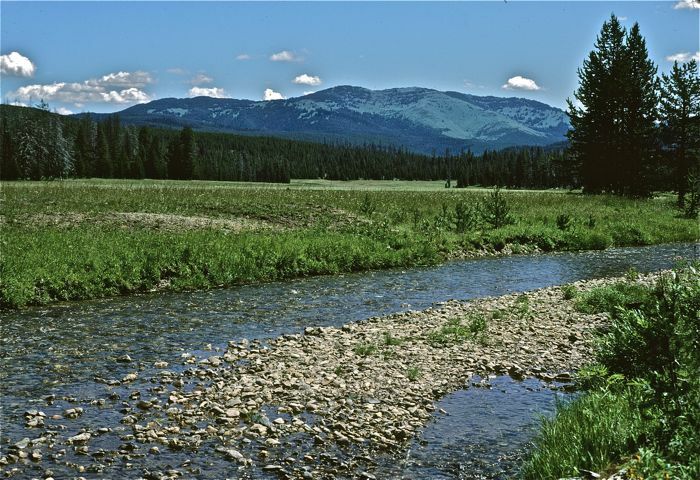 STATUS: So far, Congress has failed to designate the Yellowstone back-country as Wilderness. ITINERARY: The trail-head, near the South Entrance, is about 2.5 hours driving time from Gardiner. A day one vehicle shuttle to the trailhead where the trip ends will take about an hour. All of our routes are loops, and campsites are reserved in advance for our exclusive use. There will be one or two layover days.